But I only have one tricolor. How do I produce tris? So you only have one tricolor and you're having a hard time finding another tricolor or harlequin. This page will show you what you can use to produce tricolors. 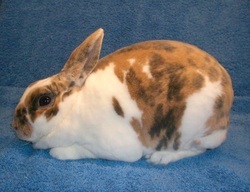 Blue/Fawn Tricolor Charlie Doe. Genetics: A- B- C- dd ej- ENEN. 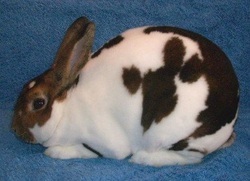 Breed a charlie to a solid/harlequin and get 100% brokens/tricolors. 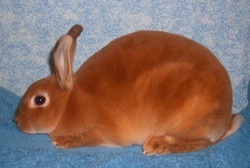 Lilac Fawn Buck (not to be confused with Lilac/Fawn Tricolor or Harlequin.) Genetics: A- bb C- dd ee enen. This buck was out of two Lynx who carried Ee. 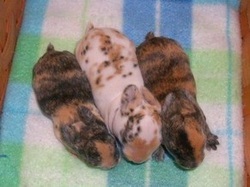 Litter of all Blue/Fawn Tricolors. Genetics: A- Bb C- dd eje ENen. 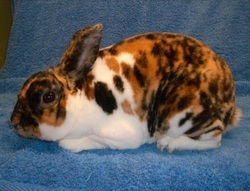 Black/Orange Tricolor Buck with blanket pattern. Genetics: AA BB C- DD ejej ENen. Tort Otter (Fox) Doe. Genetics: ata B- C- D- ee enen. This doe was out of a black otter who carried atat and Ee and a black buck who carried Ee. Aat or Aa B- C- D- eje enen or ENen. 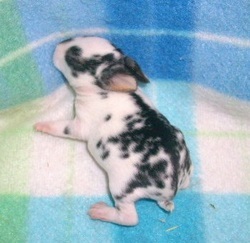 Blue/Fawn Tricolor Doe with blanket pattern. Genetics: Aa B- C- dd ej- ENen. Black Otter Buck Tri Carrier. Genetics: ata BB C- DD Eej enen. 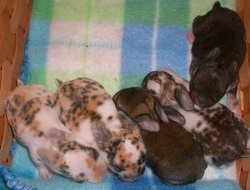 Litter of 4 (exclude red on left as it was a foster from another litter). 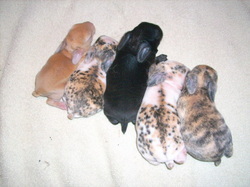 Two Black/Orange Tricolors, one Black/Orange Harlequin and one black. 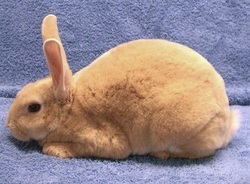 Tricolor/Harle Genetics: Aat or Aa B- C- Dd ejej ENen or enen. Black Genetics: aa B- C- Dd Eej enen. This has a little different outcome because of the recessive genes. 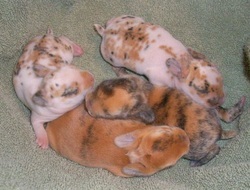 The Black/Orange Tricolor Doe is a Charlie. She carries Aa B- C- D- ej- ENEN. Black Otter Tri Carrier buck carries atat B- C- D- Eej enen. 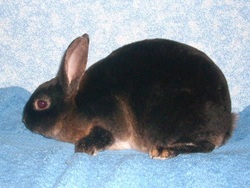 First pictures is a Broken Black Otter. His genetics are ata B- C- D- Eej Enen. 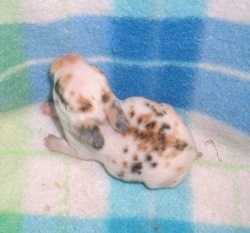 The last picture is the only Black/Orange Tricolor in the litter. Genetics are Aat B- C- D- ejej ENen. 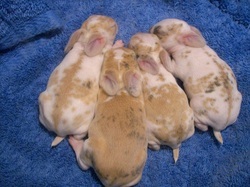 And the rest of the litter. Two more Broken Black Otters and Two Broken Castors. The otters have the same genetics as the otter kit above. The Broken Castors are Aat B- C- D- Eej ENen. 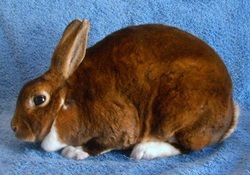 They inherited the agouti gene (A) from their mother and the long extension gene (E) from their father, making them castors. Harlequin Otter doe. She appears to be agouti, but is out of a Black Otter doe who carries atat and Ee and a Black buck who carries aa and Eej. Her genetics are ata (otter hiding self) and eje (tricolor hiding red). 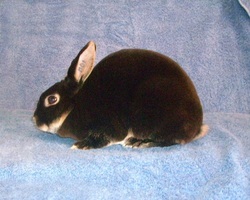 Kits are one Black/Orange Tricolor and two Black/Orange Harlequins. 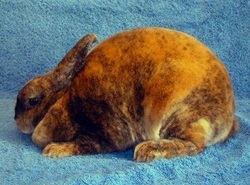 Kits genetics are Aat or Aa and ejej or eje. 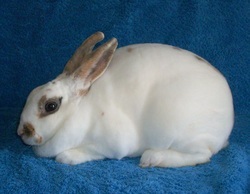 Sire is broken castor from castor and harlequin (he carries red gene recessively). 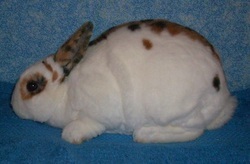 Dam is booted castor from castor and harlequin (she carries tricolor gene recessively). Kits are two broken castors, one tricolor and one booted tricolor (looks like a harlequin). Sire is broken castor from castor and harlequin (he carries red recessively). 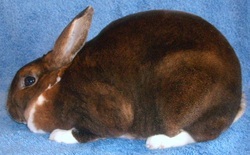 Dam is booted castor from castor and harlequin (she carries tricolor recessively). 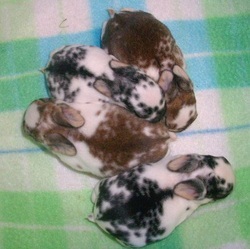 Picture shows 5 of 7 kits born (2 were fostered). Two tricolors, 2 broken castors, 2 solid castors, 1 booted castor.